California is home to approximately 5 million people over the age of 65 — more than any other state in the country. Of that population, 36,694 individuals live in Santa Cruz County. There’s significant research on senior health, economic welfare, demographics, technology use and more. However, there are few studies on intimacy as people enter the 65+ range. The following individuals were interviewed at Kindred Nursing Home and La Posada Retirement Community in Santa Cruz. They shared personal experiences with love and relationships, providing some insight into what it’s like finding love in old age. Three times a week Nancy Forsberg visits Harry Woodward at Kindred Nursing Home. Nancy does her best to bring him chocolate and take him out for a milkshake when they both feel well enough. Harry proceeds to give Nancy one of his drawings, a new hobby he has taken up in recent years, every time she visits him. Photo by Casey Amaral. Eighty-three year-old tenor saxophonist Harry Woodward caught sight of Nancy Forsberg 21 years ago while performing with his band. Immersed in his jazz melodies, a reflection in the crowd caught Harry’s attention. He turned to find Nancy, then 53 years old, swaying her body around the dance floor. It was a pin on her shirt that glimmered, and happened to be in the shape of a tenor saxophone. The two hit it off immediately. “It sounds stranger than it is,” Harry said. “It all came about very naturally.” There were no secrets and a lot of support. When asked what their favorite thing to do together was, they both looked at each other and Nancy said, “Besides making whoopee?” and they fell into a fit of laughter as they held hands. “We’ve laughed a lot,” Nancy said. They stress that humor may be the most important part of a relationship. “We share a similar sense of humor — kind of wicked, kind of dry, very British,” she said. 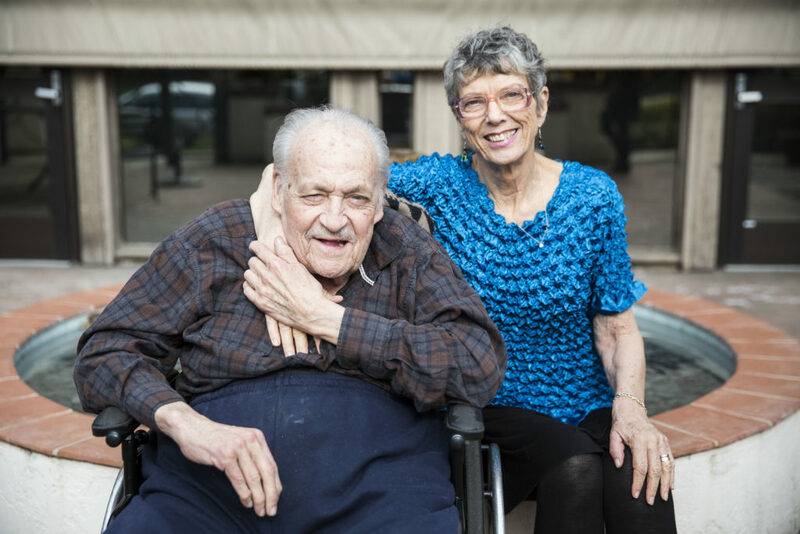 They wanted to grow old together, “and here we are,” Nancy said, hand in hand with her partner. They can’t go dancing like they used to or roll around in the sand all day, but “we hold hands, that’s about what’s left,” Nancy said with a chuckle. “Love is what makes life worth living. And I wish it to happen for everyone,” Harry said with his hands folded in his lap, straightening his posture in his wheelchair. Marion Hajdu spends much of her time still working part time as a graphic designer and taking care of her furry companion, her dog Rose. 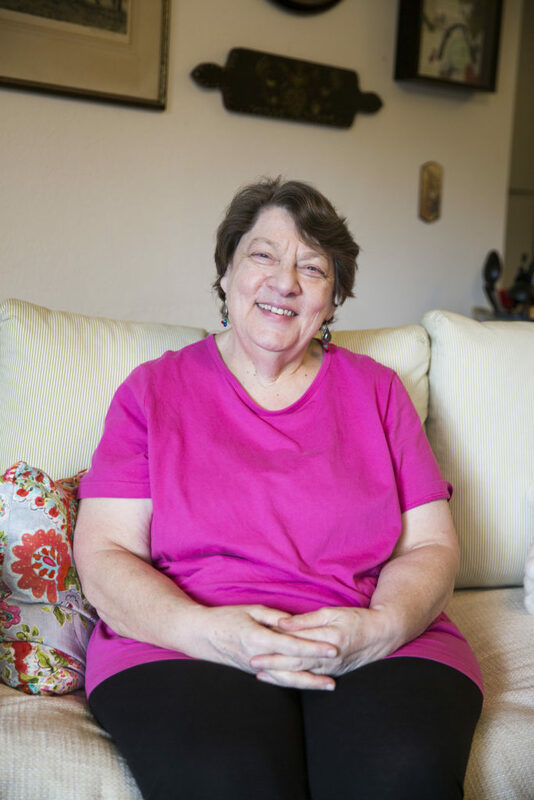 She hopes to start working less as she gets older and spending more time with friends. Photo by Casey Amaral. Marion Hajdu, 70 years old this April, spent the first 10 years of her life in Budapest, Hungary before moving to the United States with her family. Marion spent most of her adult life in New York where she learned about the cutthroat competition of the city. She was racing to find a man who could complete the societal picture of “success” in a place where women heavily outnumbered single, straight men. “I was tired of being lonely and hunting for something that wasn’t happening,” she said. In her 50s, Marion gave up on romantic love. She never married or had children. When she abandoned this limited notion of finding a spouse she said, “I felt like I actually liberated the love.” She began to see the overwhelming affection from all the other relationships in her life — her family, her friends, her pets and most importantly, her relationship with herself. “I love that I can love myself,” she said. When she found self-love is when she finally started to feel free. With a long list of past lovers, Margarite Tuchardt is no stranger to intimacy and hardship. 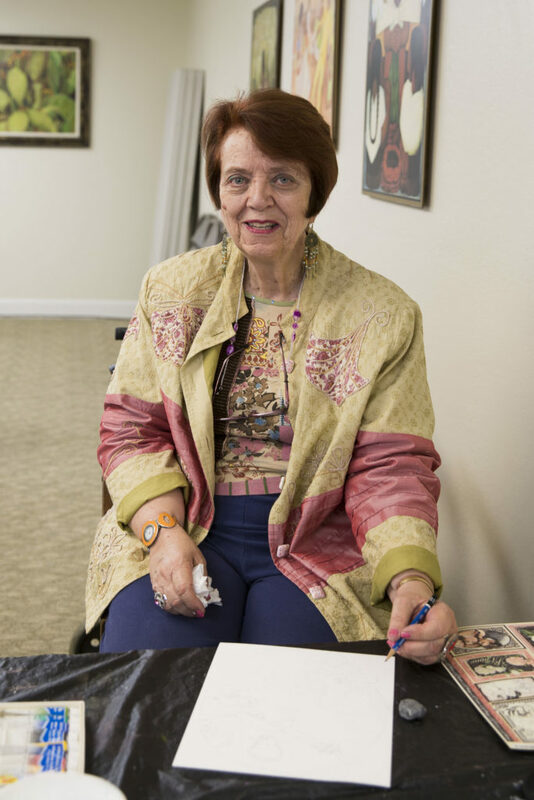 A recovering alcoholic, mother, ex-wife and active participant in the women’s liberation movement in the 60s, Margarite has a diverse share of experiences but says she’s excited to see what the future holds. Photo by Casey Amaral. Margarite Tuchardt is 77 years old and has been a Santa Cruz resident since 1966. Of all the loves she’s had in her life, she recalls her musician lover Bill, a fiddler, most vividly. When she met Bill, she was 44 years old. That night, they ate at a diner and afterward Margarite kissed him in the parking lot, igniting their “summer of love.” Bill was in Santa Cruz taking lessons from a more experienced fiddler, but planned on leaving in September to go back home. The countdown made the relationship even more exciting and intense, she said. The two middle-aged adults loved like teenagers during that 1983 summer. “Our love was the only thing that mattered. It was all-consuming,” she said. When September came around, the two split ways and Margarite was crushed. “I collapsed for months, I couldn’t do anything. My friends had to take care of me.” She slowly regained composure and had other romantic relationships but none that matched the love she had for Bill. Four years ago she decided she had to see him one last time. Although she hadn’t seen or spoken to him in 30 years, she called to tell him her plans on visiting. She flew to meet him, and Bill greeted her with flowers and candy at the airport. As soon as they saw each other, she said, the electricity was back. But just like the first time, when they went their separate ways it was like an iron curtain came down, she said, it was quick and cold. “I cried all the way home,” she said.